Hello root beer enthusiasts... i know it has been a couple months since i have posted and for that i apologize, but the good news is i just took a cross country trip with a friend and rounded up several more root beers to go through. Not promising a high volume of posts, but hopefully i will have less breaks in between. Anyway, we planned our trip so that we would pass along the southern united states from North Carolina to Arizona. Unfortunately we only made it as far as Baton Rouge, LA before Richard's car broke down and i had to catch an early flight home for work and school. BUT!... luckily we did pass through Mississippi before that, and that is where today's root beer hails from. 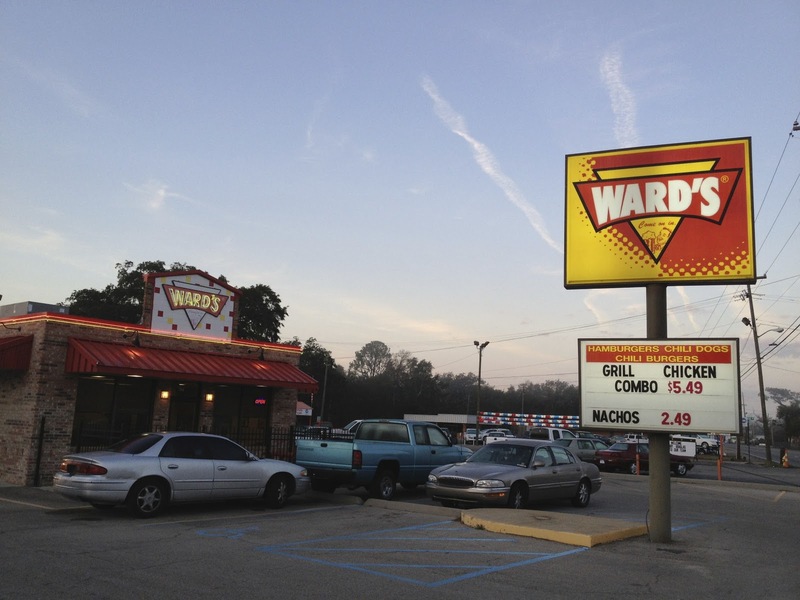 Ward's is a chain of fast food restaurants in Mississippi. I heard about Ward's a few years ago from one of my friend's little sisters. She had married a guy from Mississippi and they knew i was doing this blog and told me i had to try the root beer there. He was emphatic that it was fantastic, but I figured i would probably never get a chance to get down there since i had no reason to go to Mississippi. Then my friend Richard moved across country and asked me if i'd help him drive, so i told him as long as i could plan out the route i was up for it. Talking about the Ward's restaurant we visited in Gulfport, MS i can't say much. It was really small and typical of a fast food restaurant in structure and arrangement. We were there at 7:00 in the morning, but they served their entire menu all day. So naturally, Richard got the deep fried shrimp plate and i got a burger and fries. The fries were decent, but the burger was super bland. We didn't expect much though. Most of the reviews we read about the place said the food was not good (and they were right). We both got drinks with our meal and helped ourself to the root beer that was so highly recommended. Normally this is the part of the blog where i talk about the bottle or can and the label, but this was just in a fast food fountain cup (not sure the volume in liquid oz.) and the label is the dumb Ward's logo on the cup in red and yellow. A triangle, some writing, you get the point. No big deal and nothing to get all excited about. i photoshopped the "root beer" onto the cup in the picture above just to make sure everyone knew what i was drinking. Also for me in case i forget. I sometimes do that. 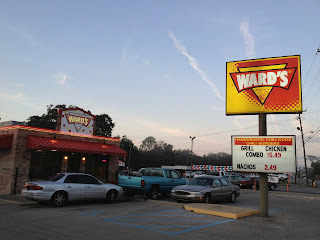 Does Ward's live up to the hype of one guy i met a few years ago that is married to my friend's sister? Not really. It's not a bad taste, but i'm not a fan. I think i can nail it dead on by saying it tastes like syrup. Not like soda fountain syrup you mix with carbonated water to make soda, like syrup you put on your pancakes. Like maple syrup. It tastes exactly like a pancake. And it is SWEET. Too sweet. Way way too sweet. Now, i don't mind pancakes. I prefer waffles, but in both cases i use a generous amount of syrup. However, what i don't do is drink syrup directly from the bottle, which is basically what drinking this root beer was like. It was so rich and sweet that neither Richard or I could finish our cups and poured them out about a third the way through to get something else a little less... diabetes inducing. My official review is that Ward's gets 4 (four) IBCs. Like i said above, just way too sweet. Not a fan. It's not that it tasted bad, but i couldn't even finish the cup, and for that i couldn't even bring myself to give it a 5. I don't know how you would make this better (or even bearable). Maybe thicken it up and pour it on some pancakes? No, that would be ridiculous. Everyone knows waffles are better.